Was reading Commando 4243 the other night "Dangerous Despatches" and not only was I pleased to see Ferret eating pie and mash but he was eating it with a spoon in the traditional way (as I do). Is Keith Page a Londoner? The world's first pie and mash shop opened in Tower Bridge Road in the 1890s and is still there. My local high street has two eel and Pie Houses (as they are called) both of which have also been on site for over a century. I pleased to see Ferret eating pie and mash but he was eating it with a spoon in the traditional way (as I do). Is Keith Page a Londoner? The world's first pie and mash shop opened in Tower Bridge Road in the 1890s and is still there. My local high street has two eel and Pie Houses (as they are called) both of which have also been on site for over a century. Whenever I go down to stay with my elder son, who lives on the snobby side of Canary Wharf, I always slum it a couple of times a week and go down for pie and mash for my lunch to a cafe set back from the road just as you enter Poplar market. The first time I went there, the proprietor put something over it that I think she called licquor. I had assumed, being a Northerner, that I would automatically get gravy. I did insist on gravy, so that meal went to the person behind me in the queue, but to this day I don't know what is in that licquor but it looked seriously unappetising, a bit like the parsley sauce in some frozen cod fillet meals from Ross or some such outfit. I ate it in my time-honoured way, with my fork in my right hand. We Northerners can cope without having recourse to a spoon. Innit. You can't eat Pie & Mash without Liquor, do like Jellied Eels lovely? 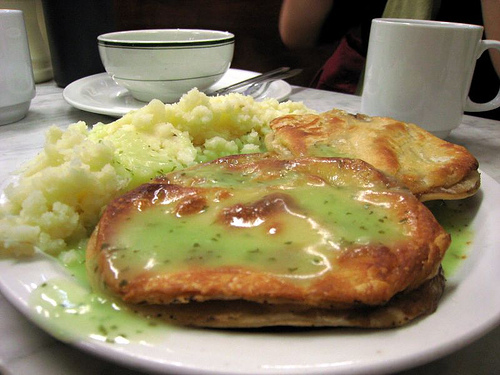 I had some of that licquor stuff poured onto my pie and mash when i was in London last year. I thought it was good old mushy peas until I tasted it. Nasty. London is another country, they do things differently there. And pay through the nose for it too. Up here we catch fish, you know like proper fish. Then we cook 'em and eat 'em, usually with chips, as Alf Tupper used to. On the rare occasions when we inadvertently snare some eels, we chuck 'em back in for the pike. I seem to remember Alf eating some eels once, after some international meeting down in your neck of the woods, but the chippy had shut and he was starving. Any port in a storm, I suppose. As for the parsley, steelclaw, thank you for the recipe, but I have to tell you that my stomach would complain in time-honoured fashion if I were to forcefeed it with what looks for all the world like frogspawn that has been going off for a week or so. My dad used to think tripe was food. He was also fond of trotters, cow heel, pigs' feet and rabbit. I suppose it was his working class upbringing in Salford. Fortunately, I was heir to a number of more refined tastes via my mother, a middle class schoolteacher. If she was ever tempted to prepare clog soup, a haunch of gerbil or grilled whippet steaks for my tea, she very quickly suppressed such urges. However, she did allow me to devour virtually all the books she had in the house. If I'd devoured my dad's books, though, I would have been that bit closer to consuming animals, as his small collection consisted principally of Sporting Chronicle Form Books. P.S. 1 The onions would be fine. P.S. 2 Love the smilie. I've not seen that one before. Yeah, get in there STARBOY. Rabbie Burns, Rob Roy Macgregor and Slim Jim Baxter didn't get their great successes by eating tripe. I'm sure it's no coincidence that that's why tripe is also another word for rubbish. I must admit I can't recall its smell but that wasn't what put me off it anyway. It was white, uncooked, sat alone on my dad's dinner plate overhanging at the edges, with lots of cracks and circular valley-type indentations in the top part, a bit like a moonscape really, and it wobbled. I suppose it would do as it is the stomach of a sheep or other ruminant. He did eat tomatoes with it I must admit, as he treated it a bit like a salad. I am sure that he would have survived in Zimbabwe. I doubt if anyone could look at a piece of tripe in the same way after reading George Orwell's The Road to Wigan Pier. Tripe looks like that piece of fat between the meat and crackling on those pork belly slices. I love Haggis, I haven't tried Deep Fried Mars bars yet. Phoenix I'm pleased to see you have refined your taste now although haunch of gerbil sounds gorgeous I think you missed out. That's just too tantalizing, Phil. My Penguin copy seems to have gone walkabout so, if it's not too much trouble, could you please post the relevant quotation.